The 1986 Suzuki Cavalcade LXE for sale is fully loaded with cruise control, air ride PLUS the new owner will receive 2 motorcycle Helmets equipped with with mics/speakers. The Suzuki motorcycle for sale runs great and has no problems except that it will need to have the left side fairing replaced. I'm only interested in selling the Suzuki cavalcade out right and am not willing to consider any trade. If you want to get further details you can email me your questions and offers using the space below provided by Strike Lightning Used Motorcycles for Sale (and PLEASE include your contact information!) and I will respond with answers to your questions or after consideration of your best offer as quickly as possible. Strike Lightning would also encourage bikers to submit a review of the 1986 Suzuki Cavalcade LXE for sale to make the biker community aware of any problems that are common to The Cavalcade or to highlight its positive features and help potential buyers make informed decisions. There is no other bike on earth that can match the Cavalcade's power. The bike can handle anything you can come up with. 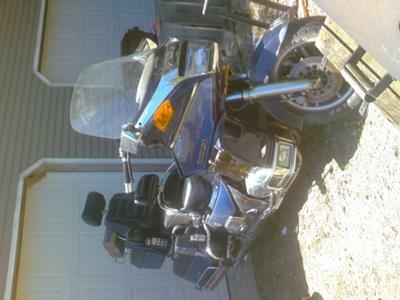 The air seat for both riders is great and stereo and cb radio are good, too. I ride an 86 LXE Suzuki Cavalcade and pull a camper behind it. I don't even know it's there! I have to look to make sure it's there. I would not do this with a 1500 or lower Goldwing; they are no match to the Cavalcade and I wish they would come out with a new model! Price is firm. Bike has a lot of options and is in great mechanical condition. Only cosmetic.